GEEK alert: I get overly excited when I find something new in the produce section of any market! True story. In the Philippines, we have our fair share of good and uniquely local produce. Although, since I watch and live for cooking shows, I like to imagine myself being given a basket of mystery ingredients like CHOPPED! Meaning challenging myself to something I haven't cooked before using unusual ingredients available. So imagine to my surprise when I saw a pack of Habanero Peppers for only Php40.00!!! I grabbed it and never looked back! I like food with some kick (and even a punch) in it. But boy, Habanero peppers with seeds in them are 3 knees in the groin, at the same time! These peppers though, if deseeded are more forgiving. The spiciness only hits the tongue but doesn't linger there for too long. You need some sweetness to counter that heat. Since the Philippines is rich in succulent and sweet mangoes all year round, it was only logical to get them acquainted in my blender. Serve with blackened chicken, shrimp or fish. 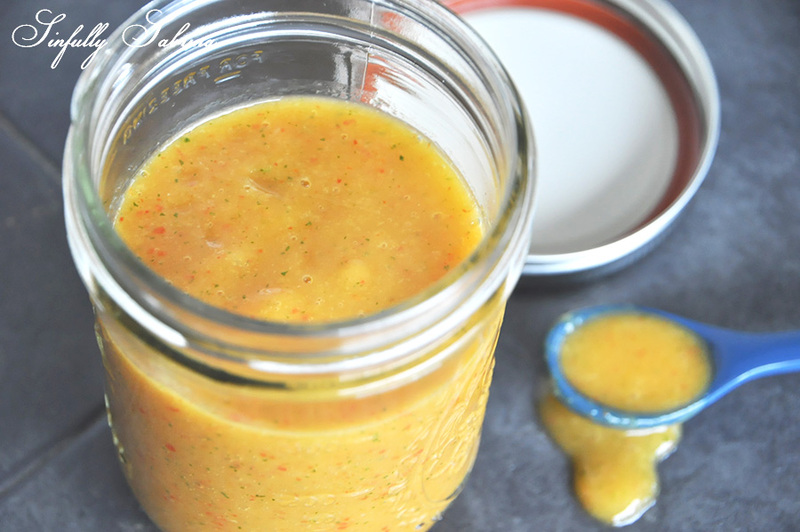 Warning: This sauce is super spicy so drizzle conservatively unless you have an iron tongue!